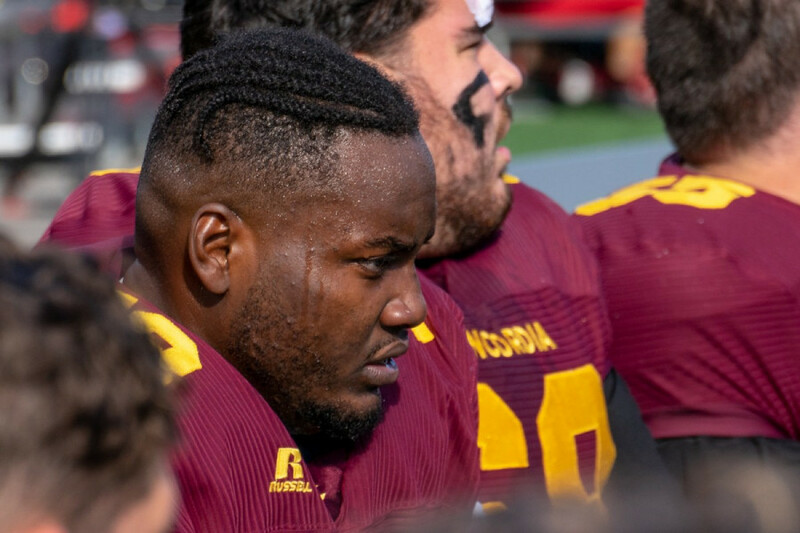 Concordia football’s Maurice Simba has been selected as the first Canadian university athlete in history to play in the NFLPA Collegiate Bowl at the Rose Bowl, to be held in Pasadena, CA this coming January. Founded in 2012 by the National Football League Players Association, the NFLPA Collegiate Bowl is an opportunity for young, draft-eligible college football players to showcase their talents to scouts and fans alike. Set to be in attendance are over 200 NFL scouts, player personnel staff, as well as coaches and general managers from all 32 NFL franchises. Simba was shocked when he heard the news, but now the Stingers six-foot-eight offensive tackle eager to show off his skills to such a crowd. The Democratic Republic of the Congo native says he could never have imagined that such big things were waiting for him in the football world. Head coach Brad Collinson had nothing but good things to say about this nod, noting that the honour was well deserved. “For him to achieve something that no other Canadian has done yet is a big step, and obviously the next step in his potential pro career,” said Collinson. Collinson feels Simba’s recognition reflects well on the program. Seeing Stingers gain international recognition, the Stingers head coach said, in terms of recruiting, “it’s a positive.” But Collinson emphasized that it’s not all about that, but about the hard work and commitment put in by Simba time and again. “This is just a cherry on top for Maurice, who has been a team player for Concordia and a look at when you do things the right way, it pays off,” continued Collinson. This is not the first time good news has come Simba’s way. Ahead of the season, the offensive giant made the NFL’s top 20 prospects list, at number 18. Simba, who is draft-eligible for the 2019 NFL and CFL drafts has been on the CFL’s radar for some time now, respected for his size, skill as well as his character. More recently, Simba’s been on the NFL scout radar. According to a Stingers press release, the Pittsburgh Steelers had sent a scout out to a Stingers game this season to evaluate him, while other NFL teams have been in contact with him. For Simba, this isn’t the time for him to kill himself over impressing scouts. He’s choosing instead to treat this as any other game and to focus on enjoying the experience. The RSEQ second team all-star is calm ahead of the game, going in with what he sees as realistic expectations, much like he did when he attended the 2018 East-West Bowl this past May alongside teammate Matt Halbgewachs.